Less than two weeks away, Oct. 4 stands out as World Animal Day, an opportunity to focus attention on endangered species while celebrating animals' roles in human lives. The celebration began in 1931 during a convention of ecologists in Italy and expanded its focus in recent years. By clicking on a region in this map, you can find events near you. Want to organize an event that focuses on wild birds? Click here for tips and guidelines. It's not too late to enjoy the latest edition of the bird-blogging carnival, I and the Bird. Hosted by Grant at Birds on the Brain, you'll find many bloggers' posts as well as related books recommmended by Grant. You might find some items to add to your personal wishlists or to purchase as gifts for other birders. Mark your calendar for the next edition, which will be hosted by Larry at The Birder's Report. He needs to receive an e-mail with a link to your most recent, noteworthy blog post by Tuesday, Sept. 28. Our carnival needs hosts in October and November! Contact Mike now to ensure that this unique blog carnival continues through the year. Traditionally held on the third Saturday of September, International Coastal Cleanup Day included Filipino youth at Manila Bay as well as schoolchildren near Tampa, Fla. 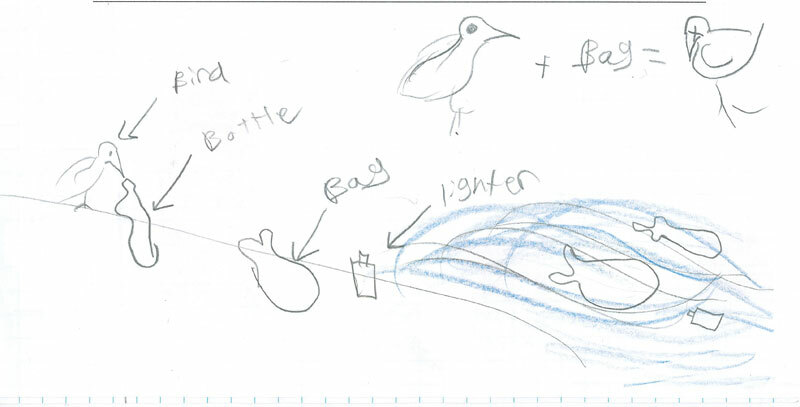 Many more groups plan to collect litter and debris from waterways and shores on Sat., Sept. 25. Ocean Conservancy spearheads the annual event, with this being the 25th year. You can find an event near you by searching via this map. In California, the event has earned honors from the Guinness Book of World Records as "the largest garbage collection" (1993). 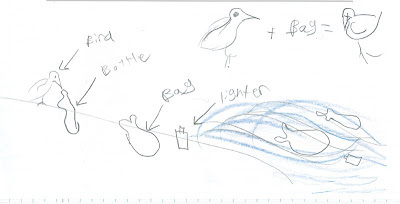 Last year, fourth-graders in New York City gathered debris, catalogued it and shared their thoughts; as Oliver said, "Birds are lovely, and die from us. When they see a lot of trash, they don't think once, they just eat. Then are poisoned." In the Golden State, the U.S. Fish & Wildlife Service will acquire more land after receiving funds from the Migratory Bird Conservation Commission. The money comes from the Migratory Bird Conservation Fund, which includes proceeds from the sales of the Migratory Bird Hunting and Conservation Stamp, known as the Federal Duck Stamp. * Humboldt Bay National Wildlife Refuge in Humboldt Bay County: Acquisition of 167 acres that will help the refuge’s management capability and allow for native plant restoration. This refuge includes coastal dunes, scrub forest and beachfront. 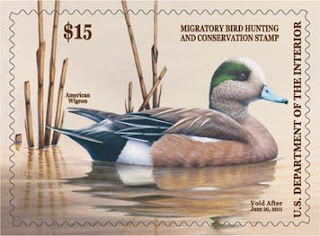 * Stone Lakes National Wildlife Refuge in Sacramento County: Acquisition of 104 acres to secure a corridor of wintering habitat for Tundra Swans, White-fronted Geese and various duck species. * Tulare Basin Wildlife Management Area in Kern and Tulare counties: Acquisition of 1,250 acres to secure habitat protection and create a larger block of contiguous habitat with compatible land uses. MBCC also approved $3 million in federal grants under the North American Wetlands Conservation Act for conservation projects in California that will protect, restore and enhance wetlands and associated habitats across the state. For more information about these projects, visit this site. You'll find more information about North American wetlands and waterfowl conservation at FLYways.us. Since 1929, the Migratory Bird Conservation Commission has met several times each year to consider land purchases through the MBCF. In 1989, NAWCA added the grant program approvals to the commission’s responsibilities. The Migratory Bird Conservation Commission includes Sen. Thad Cochran (R-MS) and Blanche Lincoln (D-AR), Rep. John Dingell (D-MI) and Robert Wittman (R-VA), Secretary of Agriculture Tom Vilsack and Environmental Protection Agency Administrator Lisa P. Jackson as well as state representatives as ex officio members who vote on projects located within their states. Birders have long longed to understand how birds in flicks move in synchronicity and appear to make snap decisions as a group. 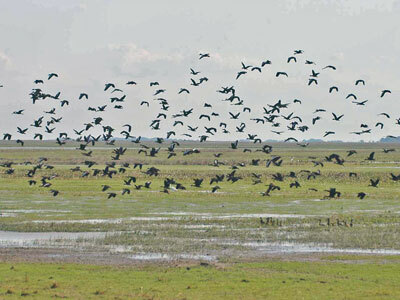 Researchers from Budapest, Hungary, used a particle model to investigate flocks of birds landing on foraging flights. In the report published in "New Journal of Physics," the researchers describe their use of a self-propelled particle system in whcih the particles represent birds with parameters like position and velocity. The scientists found that "the collective switching from the flying to the landing state overrides the individual landing intentions of each bird. The researchers said, “Our main motivation was to better understand something which is puzzling and out there in nature, especially in cases involving the stopping or starting of a collective behavioural pattern in a group of people or animals. Will you be in The Aloha State, specifically on Kauai, later this month? You can receive free admission to Kilauea Point National Wildlife Refuge on Sept. 25 between 10 a.m. and 4 p.m. in honor of National Public Lands Day and Nene Awareness Day. National Public Lands Day celebrates the 655 million acres of forests, parks, refuges and open spaces that all of us own. At Kilauea Point NWR, visitors can check out the Kīlauea Lighthouse restoration project and also learn about native coastal plants and migratory seabirds. 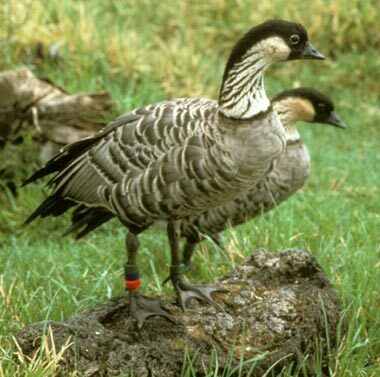 Designated Hawaii's State Bird on May 7, 1957, the endangered nēnē (Branta sandvicensis) struggles against extinction. Conservationists began breeding the birds in captivity in hopes of preserving a remnant of the declining population and, some day, successfully re-establishing them in their native habitat. Today, there are more than 800 nēnē on Kauai and approximately 1,950 nēnē statewide. Interested in finding more than 300 bird species while birding along the freshwater shoreline of New York and Pennsylvania? 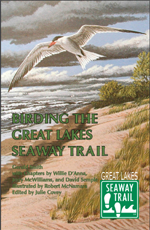 The Great Lakes Seaway Trail Birder's Checklist can help you do that while traveling the 518-mile route. This America's Byway route includes waterfront and sandy dunes, field, forest and wetlands, and the checklist covers species commonly seen in areas ranging from the Akwesasne Mohawk Nation on the St. Lawrence River to the Pennsylvania-Ohio border on Lake Erie. The list also includes rarities and vagrants. Smith says the stars of the fall season at Braddock Bay Bird Observatory west of Rochester include kinglets and Hermit Thrushes seen by the hundreds and the many landbirds banded by observatory staff each autumn to provide data on the movement of individual birds and bird populations. A program aimed at schoolchildren and created by Council for Environmental Education, Flying Wild partners recently worked with Boy Scouts of America and Girl Scouts of the United States of America to integrate the environmental education activities with current scout badges and Try-It Activities. This document shows the correlations between Flying Wild items and the Girl Scout projects for Brownies and Juniors, while this file covers the Boy Scout projects, ranging from Cub Scouts, Tigers, Wolfs, Bears and Webelos to Boy Scouts. The Washington, D.C.-based nonprofit Restore America's Estuaries recently released the program schedule for its fifth conference, scheduled for Nov. 13-17 in Galveston, Texas. Focusing on the restoration of coastal and estuarine habitats, the group will look closely at "Preparing for Climate Change: Science, Practice, and Policy" through panel discussions and presentations. The National Conference and Expo has taken on a new level of importance due to the tragic events continuing to unfold in the Gulf of Mexico. Stopping the leak and preventing oil from reaching the coast are only the first steps in a process that will take years-and likely decades-to resolve. RAE has responded to this environmental, economic, and human disaster by adding high-level sessions and roundtables to the Conference program devoted to the science, policy, and technologies dealing with oil remediation and coastal restoration. Details about the conference appear here, while the program schedule is available here.